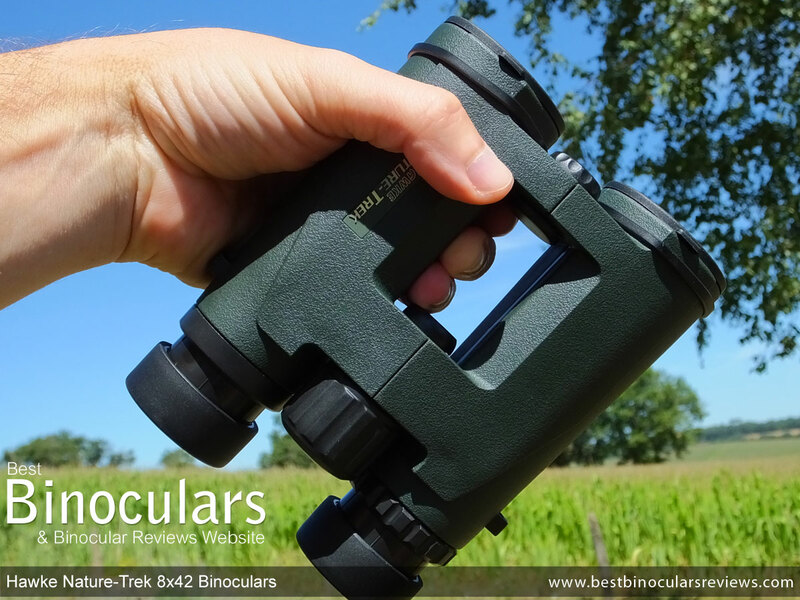 Hawke Optics actually produce two versions of the low cost 8x42 Hawke Nature-Trek binoculars, an open bridge version (HA3933) designed to be lighter and a little easier to hold onto and which I wrote a review on a short while back here (Hawke Nature-Trek 8x42 Open Hinge Binoculars Review) and they now also have this newer single or top hinge version (HA4152). 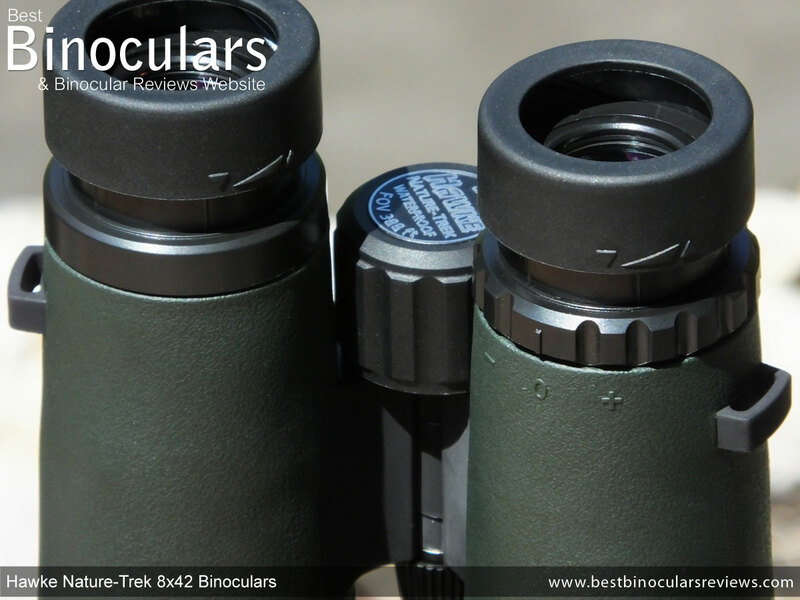 To help and hopefully make it easier for you to choose between the two and indeed other 8x42 binoculars within this price category, I will be comparing the two 8x42 Nature-Trek's and other similar ones throughout this review. 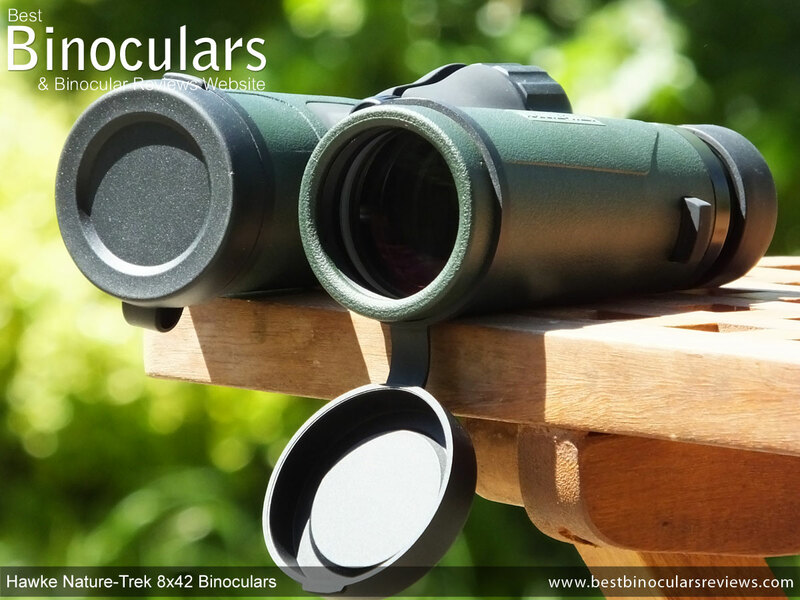 To get a cheaper binocular right is quite a difficult balancing act for the manufacturers as they have to meet or preferably exceed the users expectations, but at the same time they have to keep the cost of the product down. So whilst I think we all can accept and understand that in order to keep the costs down, something has to give and they can't posses all the components and qualities of those that cost many times more, but knowing where not to skimp and where to make cost cutting measures is important. They must be both waterproof and fogproof - I say this even if you are never going to take them outside, this tends to be a great indicator to the actual quality of the chassis and indeed their general class. Also make sure the prisms contain higher specification glass. On bins this tends to be BaK-4, which is preferable to BK-7 glass. Ideally the manufacturer will advertise the optics as being "fully multi-coated" which is far more desirable than those that are simply "coated" or even "multi coated" as they will transmit much more light for a brighter as well as better quality view. Like the open bridge Nature-Trek's, these newer Hawke Nature-Trek 8x42 binoculars initially look good as they fulfill all three of the basic requirements listed above. 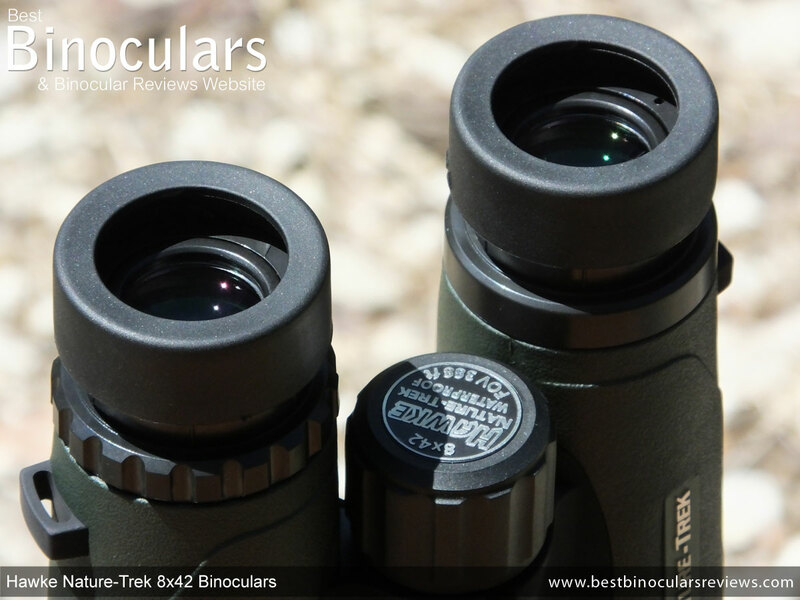 As you would expect, these and all other roof prism Hawke Nature-Trek binoculars have the same basic shape, with the eye-pieces in a straight line with the objective lenses at the other end, but and as I mentioned in the opening paragraphs, the most obvious difference between these and the open bridge Nature-Trek's, is that these sport a single top hinge body structure. The open bridge design (shown on the image on the right) on the other version of the Nature-Trek does a good job in providing you with a large area to get a really secure grip on them. This single top hinge version also exposes more of each barrel than you would normally get, but you don't get the "handle" between the two bridges so is possibly not quite as secure to hold onto. You also have to be careful with this design as a weak or poorly made single hinge could mean that the barrels end up out of alignment more easily. However checking the bridge on these Hawke binoculars, it feels very solid and would take a very large force to knock the barrels out of alignment - probably more than the optics could survive anyway. The advantage that this single hinge has is that they can be lighter due to the less material used in the construction. Almost all of the barrels, apart from a small section where the meet with the bridge is protected by a reasonably thick rubber armour. However it is also quite hard, so whilst it does not scratch or mark easily, it does not offer as much in impact protection as softer rubber covers. This hard rubber is also not as sticky as those that are softer, however it is not completely smooth and has a texture imprinted in it which helps a little with grip levels. The focus wheel and the eye-cups are also covered in armour and whilst the metallic central bridge does not have a rubber covering, it looks and feels like it has been treated or painted using a rubberized paint, which not only give a nice finish, but does a great job of making it less reflective. Compared to the open bridge Nature-Trek, this one has a far more rounded body, with far fewer square edges. Holding them is really comfortable and I found that my ring and small fingers would fit around the barrel after the bridge making for a secure grip when glassing. Overall I would say that this newer version does look and feel a little more refined and if I do say so a little more up-market and modern than the older one, but perhaps that is just my personal taste coming through? Each objective lens is positioned approximately 11mm from the end of the barrel, which in my experience is very deep and even deeper than that of the older version. What this means is that this overhang gives more protection to the lenses from scratching, as well as rain and helps to stop dust settling on them. Remember the longer your lenses stay clean, the less often you have to clean them, which will in turn prolong the pristine view you get when they are brand new. Another advantage of this is that it "hides" the glass from direct sunlight, which I am told means that the overhang of the barrels acts a little like a lens hood used by photographers and thus prevents lens flair. Hawke Sport Optics mention that the body on the new Nature-Trek binocular is fashioned from polycarbonate. This is very commonly used on bins in this price range and even though it is not as heavy-duty as the magnesium or aluminium ones used on more expensive products, it costs much less to make, is lightweight, durable, does not corrode. For the most part is should also be strong enough to handle most of what you throw at it unless you are really abusing them. Hawke have made it simple should you wish to get a completely steady view by fixing the bin to a tripod: The small cap located on the front of the hinge can be removed and this ¼-inch thread that is now exposed will accept most tripod adapters which are easily obtainable. These Hawke Nature-Trek 8x42 binoculars are waterproof, but the is no mention to what depth or if they adhere to a recognized standard. However unless you plan to go swimming with them (which I would not recommend) the seals should easily cope with most normal wet and indeed dry dusty conditions, where it will prevent moisture or tiny particles from entering the instrument. Hawke Sport Optics also remove all the air and fill the unit with nitrogen during production. This internal atmosphere is now moistureless which puts a stop to any internal fogging of the lenses and halts corrosion. The Nature-Trek has twist up eyecups, which I found to turn smoothly and without any free play. The actual lens casing seems to me to be mad from plastic, which is obviously not as strong as most metal ones, but is cheaper to make and is what I almost always find at this price point. There are also two fixed intermediate click stop points between the two extremes of completely twisted in and out. These stops as well as the long 18mm of eye-relief should allow most people, including those who wear glasses enough scope to position their eyes at the right distance to the ocular lenses in order to get a full and uninterrupted view. The eyecup itself is cased in a thick rubber for comfort when pressing them against your face. Made from what seems I think is plastic, the focus wheel is then encased in a moderately supple rubber and looks to be almost identical to the one used on the open bridge version. As on the older version, I did not find any undesirable free play on my test pair and rotating it was nice and smooth. Whilst there is a little resistance that is needed to avoid unwanted turning, adjusting the focus is almost effortless, even with one finger. This along with the deep bevelled gullies in the rubber and because the wheel itself is large (3.1cm in diameter) makes it nice and simple to reach with loads of grip. Whilst this may sound a little trivial most of the time, I also tried focusing whilst wearing my generously padded gloves that I use in winter where you have a lot less feeling and sometimes a lot less control, but once again, because of the attributes already listed I was easily able to accurately set the focus. Where these do differ slightly to the open bridge Nature-Trek, is in the gearing: With the open bridge Nature-Trek you have to make almost 2 full turns of the wheel (approx 710°) to take the focus from the extremes of near to far (or vise vera), whilst on this version you need to make just over two revolutions (approx 730°) to do the same thing. Whilst this lower gearing means large focus changes will take a little longer, the benefit it is easier to be more accurate when fine tuning the focus. For those who don't already know, the diopter it is used to calibrate your binoculars to suit your particular vision and makes up for any disparities in the vision of each of your eyes. Made from plastic, the diopter adjustment ring on this new Hawke 8x42 Nature-Trek also looks exactly the same as on the older version and indeed is much like that on most other bins in this category. It is located in the traditional position just under the right eyepiece. Whilst it does not have a click lock, nor is it notched, it is tight enough to prevent most accidental movement, yet not so tight that it is hard to fine-tune. Another point is that apart from the neutral point and the + and - signs, there are no other markings or scale. This is fine if your personal setting happens to be neutral or in-line with one of these signs, but makes it harder to remember if it is not. To remedy this you can of course make your own mark with a permanent marker, or by making a small etch with a knife, but this is something that most manufacturers overlook and would be simple enough for them to print a scale. To adjust the eyepieces to line up with your eyes, you open and close the main hinge. This Inter-Pupillary Distance (IPD) adjustment on the new Nature-Trek goes from a maximum distance of 7.2cm (on the older open bridge Nature-Trek it is 7.5cm) to a minimum of 5.5cm (on the open bridge it is 5.7cm) and thus should easily fit within the range of most people. The thinner single top hinge on these and indeed the cut-away body on the older version can both help to reduce weight. What is interesting is that these have the same overall weight as the other version. What is more they both weigh in at a mere 665g (23.5oz), which places the 8x42 Hawke Nature-Trek alongside some of the least heavy full sized 42mm bins that I have come across. Another impressive aspect to these is that whilst they do feel really light, I did not perceive them as being fragile and they definitely do not have that lightweight "cheap" feeling that you sometimes get with cheaper, very lightweight binoculars. Indeed I would like to go a step further and state that I feel that the opposite is true with these as not only do they they look more expensive than they are, the "feel" it as well. Vanguard Spirit ED 8x42 22.6oz (641g) 5.7in (14.5cm) 4.9in (12.4cm) ? Vortex 8x42 Viper HD 24.2oz (686g) 5.8in (14.7cm) 5.3in (13.5cm) ? Eagle Optics ED 8x42 Ranger 27.4oz (777g) 6.7in (17cm) 5.0in (12.7cm) ? As is demonstrated by the official measurements of these and other similar instruments (see above), the dimensions on this Nature-Trek are rather standard for a 42mm roof prism binocular and indeed also very similar to the open bridge version. I measured their minimum length by removing the lens covers and fully twisting in the eyecups to 14.1cm (5.6in), which is only 1mm shorter than the open bridge version. By completely extending the eye-cups, their length moves out to 14.9cm and then if you replace both the objective and ocular covers, their maximum length becomes 15.3cm. All of which are a few millimeters less than the open bridge version. I got a measurement of 12.7cm (5in) with the IPD set at maximum (hinge completely open). In this state and not including the tiny rubber hinges on the objective lens covers, the height is 5.5cm (2.2in), if you include the objectives, it is 6.3cm. Folding the main body hinge, their width moves down to 11cm, whilst the height extends to 7.1cm, all of which, if you look at the table above are very similar to the open bridge version and comparable to most other 42mm roof prism bins. As before, Hawke Sport Optics are pretty coy when it comes to divulging the details to the makeup of their lenses, so there is not much I can comment on here. I can point out that the lenses in the eyepiece have a diameter of 22mm, which is fairly typical on a bin of this size. All 8x42 bins deliver an exit-pupil that is 5.25mm wide (42 � 8 = 5.25), thus delivering a shaft of light to your eyes that is large enough so that you can see a comparatively bright image in all lighting conditions. These and indeed all other Hawke Nature-Trek binoculars are made using roof prisms with BaK-4 glass, which is should be a barium crown glass, but rather confusingly can in some cases be a a phosphate crown glass. Whatever the case, it is by and large preferred to BK-7 glass not only for clarity but because of the greater index of refraction it makes it possible to construct a shorter and more compact instrument. 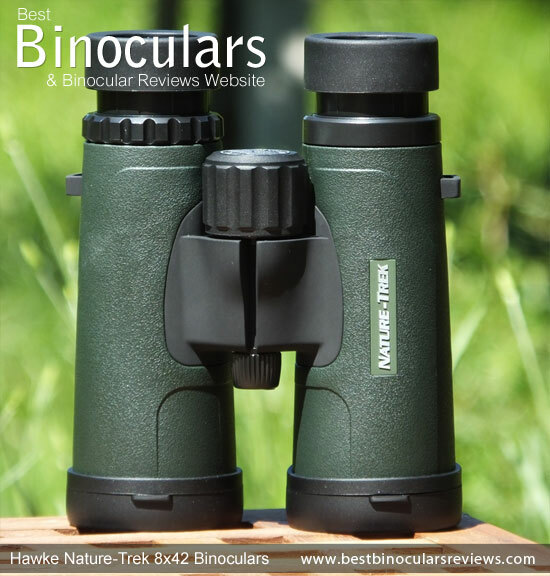 The Hawke Nature-Trek 8x42 binocular is advertised as being "Fully Multi-Coated", which indicates that every glass surface throughout the bin has had more than one layer of an anti-reflective material applied to it. These coatings are vital in that they not only dramatically improve transmittance levels and thus make a discernible difference to image brightness and quality, but prevent unwanted reflections that can cause problems. The process of adding these coatings is technically quite difficult and thus expensive, it is also interesting and you can see how it is done in this video on how binoculars are made. 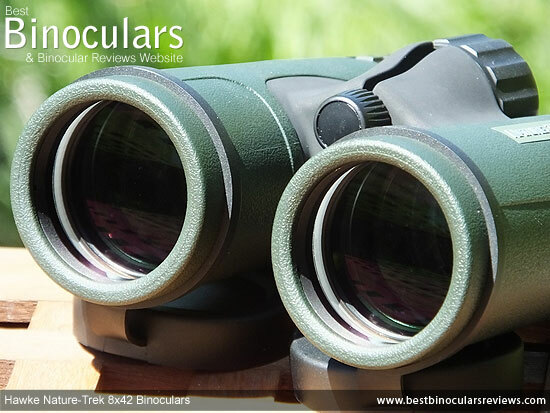 Thus because of the costs involved it is common, especially for cheap binoculars in this price range to have fewer coatings on less of the optical surfaces. These "Coated" or "Multi-Coated" optics are most definitely inferior to the fully multi-coated ones like you get on this pair. A downside to a roof prism when compared to a porro prism is that it does not reflect all the light that enters it. To help improve it's reflectivity a mirror coating can be added to this surface. Once again this material and the process of adding the coatings costs money and so on cheaper optics manufacturers will often understandably use a material that is less expensive than that which you may find on "alpha binoculars" in order to keep the manufacturing costs down. It is important to remember that whilst these cheaper alternatives may reflect a little less light, they are still much better than having no mirror coatings at all. The best "Alpha" type of bins will often use a Dielectric mirror coatings that has a reflectivity of more than 99%, whilst many bins within this price range will use coatings made from aluminium, which is much cheaper, but has a reduced reflectivity of between 87% to 93%. 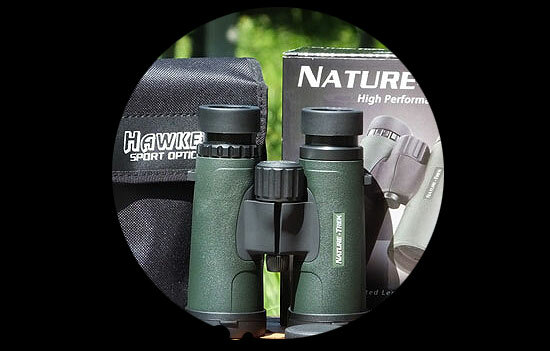 The silver coatings on these are a good compromise between cost and performance as they have a reflectivity of between 95% and 98% and which is why it is common to find them on mid range optics, which is why it is impressive to see that Hawke have managed to use them on these low cost bins. Another excellent addition to these newer Hawke Nature-Trek binoculars is the inclusion of phase correction coatings to the prisms, which once again is not something that you often see included at this price level. 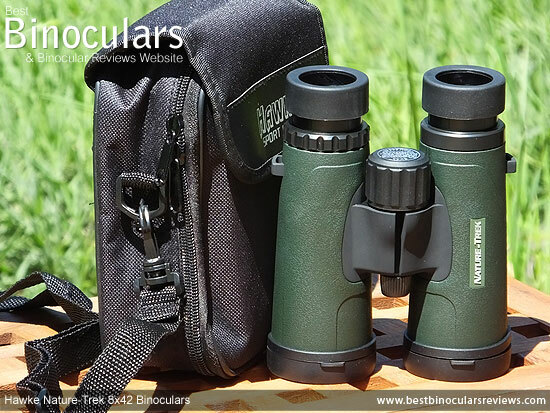 Thus as you can see from the examples above, it is understandable that these relatively cheap binoculars don't match all the optical features on more expensive Alpha type bins, but they do cover all the important basics and are as good as or better than any other in this class. Note: The question marks mean that the manufacturers do not state what is used and which usually means that there is nothing to highlight. The closest distance that you can focus on an object is stated as on these as being 2m (6.6ft), which was the same on the older version. Measuring the distance myself, I actually found that they were doing themselves an injustice and that I could get a sharp image on an object at 2.10m (6.9ft) away. This is actually a slight improvement on the open bridge version, which I measured at being 2.36m (7.7ft). Here on BBR, I regard any minium close focus distance of less than 6ft on a full sized bin to be excellent, so from that these are good, but not quite excellent. In real terms this means that for infrequent viewing of near objects like butterflies, flowers, etc. these are fine, but if it is important or indeed you main objective, I would take a look at more specialist close focus bins. The 18mm of eye-relief is long and up there with other long eye-relief binoculars. This distance along with the two midway click stops on the eye-cups sets these up as a good option if you want to use bins with your glasses on. Whilst it is a shame that I did not have the open bridge version with me to directly compare the view between them both, I did evaluate and contrast the image through these new Hawke Nature-Trek's against my benchmark 8x42 binoculars that that gives me a good point of reference. As expected with any decent quality binocular like these with a fairly big exit pupil that is larger than the size of you eyes pupil in optimal lighting, there was no observable variation in image brightness between my benchmarks and these. However and just as I did with the older version, I could just notice that my high end 8x42 benchmarks were brighter in poor light, when I tested them again at and just after sunset. So whilst their exit-pupils are the same size, the improvement is down to the use of better quality glass and coatings like the dielectric ones on the prisms that you get on expensive binoculars which do make a small difference. Keep in mind that top end binos can cost many times more (10x) than these, whereas they are definitely not 10x brighter. Evaluating them against others within this price level, I say they perform very well. Perhaps not quite as vivid as my high end bins, but once again and very similar to the older Nature-Trek that I tested, the colors you see when looking through them look natural. This is good as especially with cheaper binoculars you often get an artificial tinting caused by the use of glass with a lesser quality. The amount of contrast between light and dark looked about the same through these Nature-Trek's and that of my standard 8x42mm benchmarks and both seem to have a little less contrast than my high end 8x42 benchmarks. Whilst these is some viewable color fringing, it is very minimal and only really noticeable when you are actively looking for it by studying the periphery of an object that contrasts greatly with the background (see example on the right). Like the older Nature-Trek, this amount was about what I expected for a bin in this price level and matches or betters most of it's direct competitors. If you take into consideration that they don't use ED Glass which is designed to combat chromatic aberration, the cause of color fringing this is notable. My thoughts were that the whole image looks flat and I could only observe a minor softening near the image border that is not important. This small amount is in my experience less than most others within this class. The carry case and neck strap are exactly the same ones as is used on the open bridge Nature-Trek, so rather than just repeating myself, you can read about it on the accessories section on the open bridge review here. What are different from that used in the open bridge version are the objective lens covers that they fit over the barrel ends and not into them. This for me is a slight shame as I thought the others made the bin look cleaner and more streamlined when attached. However if you ignore the aesthetics, they work just as well: The soft rubber caps fitted snuggly so wont come away unintentionally, but are easy to put on. 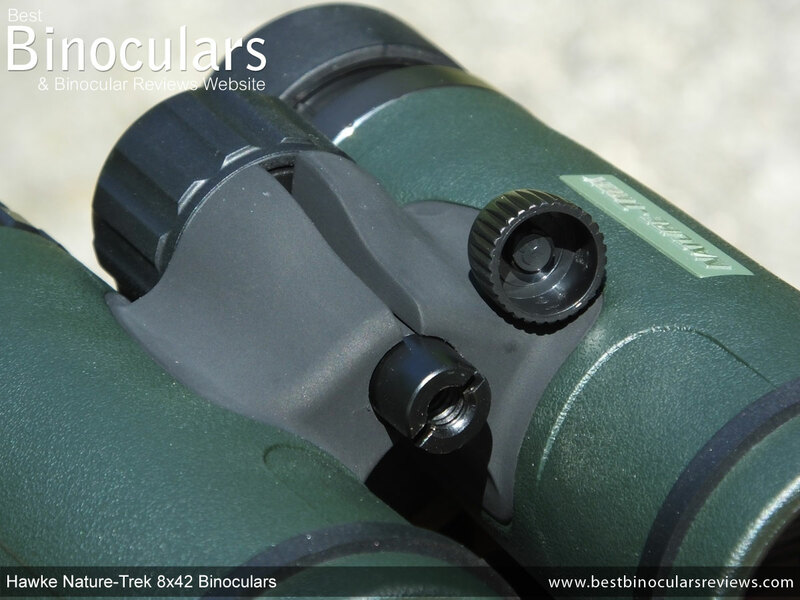 Each cover has a rubber loop allows them to remain hang down out of the way below the binocular when you are glassing, but always at hand to quickly replace with no chance that you'll mislay them. Like the objective covers, the fit was good on my test pair, easy to put on and they never fell off unwontedly. Hawke Sport Optics also include a decent quality lens cleaning cloth, which you don't always see included, especially in this price range. The Hawke Nature-Trek user instructions is like most in that it is pretty generic, but does offer basic details on how to look after the binocular, adjusting the diopter and focus it in a whole range of languages! Hawke also offer a 10 year Worldwide Warranty on this product, which within this price level is good. Details of this are also included within the booklet. Apart from the external shape, this newer "top hinge" version of the Hawke Nature-Trek is very similar to the open bridged version and so if you wanting to choose between the two, for me it would just come down to which one was cheaper or which one you prefer the look/feel of. 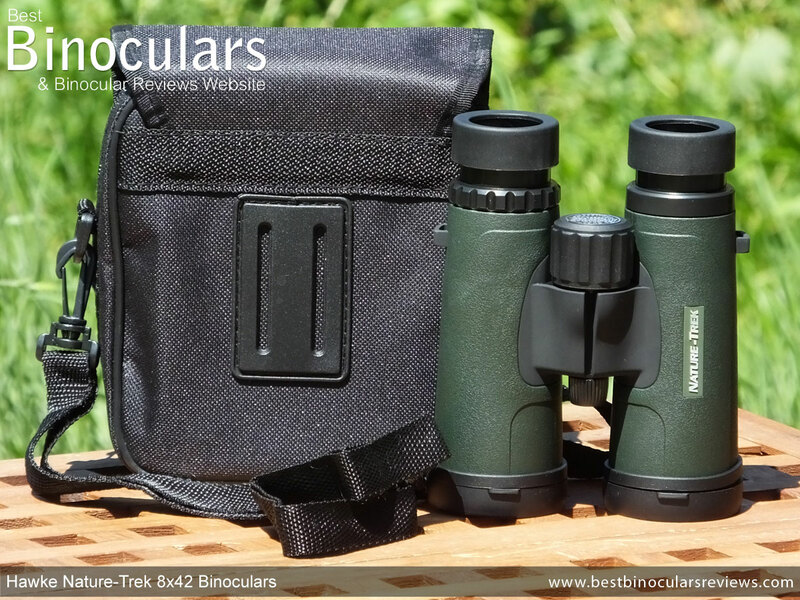 Strong Points: Like the open bridge version and whilst it may sound a little strange, one of the major strong points on these Hawke 8x42 Nature-Trek binoculars is that they don't have any major weaknesses! You see within this price range all manufacturers have to make some sacrifices and it just depends on where. 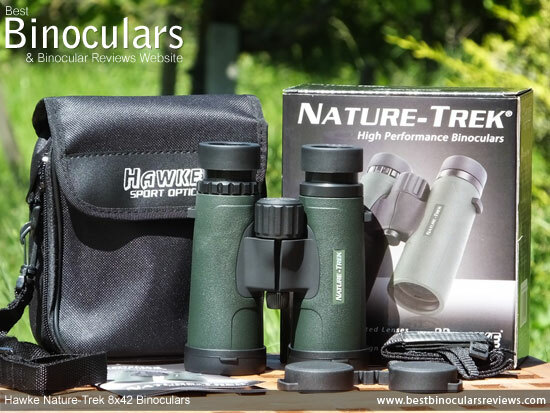 In this regard, I think Hawke Sport Optics have been smart in that they have cut costs in non essential areas, but have not skimped on performance and thus have managed to produce a well made binocular that delivers a more than respectable as well as bright image. For example the inclusion of phase correction coatings on the prism is excellent and well beyond what you find on many others at this level. As well as this their minimum focus, FOV and eye-relief are all good. What is more is they have managed to finish it off really well and I would say that these really do look and feel far more expensive than their price tag says they are and in this regard they sit quite comfortably with bins twice their price, which I feel is impressive and well worth mentioning. Weak points? As with the older version, the neck strap works well, but fairly basic. However as I mentioned before to keep the price tag down, you can't have everything an this is one of those areas that is nice to have, but a luxurious neck strap is not essential. Overall - At the beginning of the review, I discussed how on the face of it, Hawke seemed to have all the basic requirements covered. this has turned out to be the case and then some. 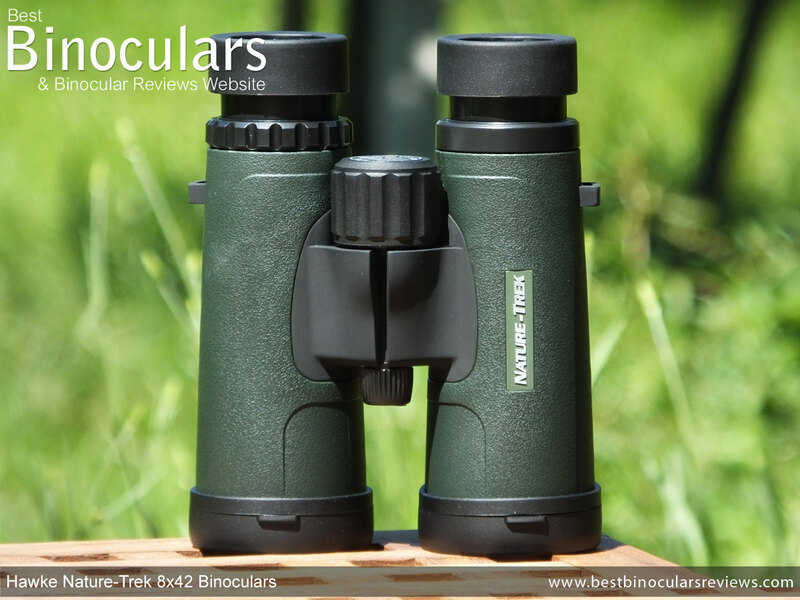 The 8x42 Nature-Trek is as good as and indeed better than most within this price bracket and I highly recommend them to those wanting a good quality low costing binocular. 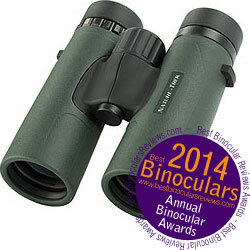 Ideal Uses: Their good field of view and more than respectable low light performance make these 8x42 binoculars good for bird watching, hunting and most other wildlife applications. As they don't have any major weak areas, they will also make a great general use optic. 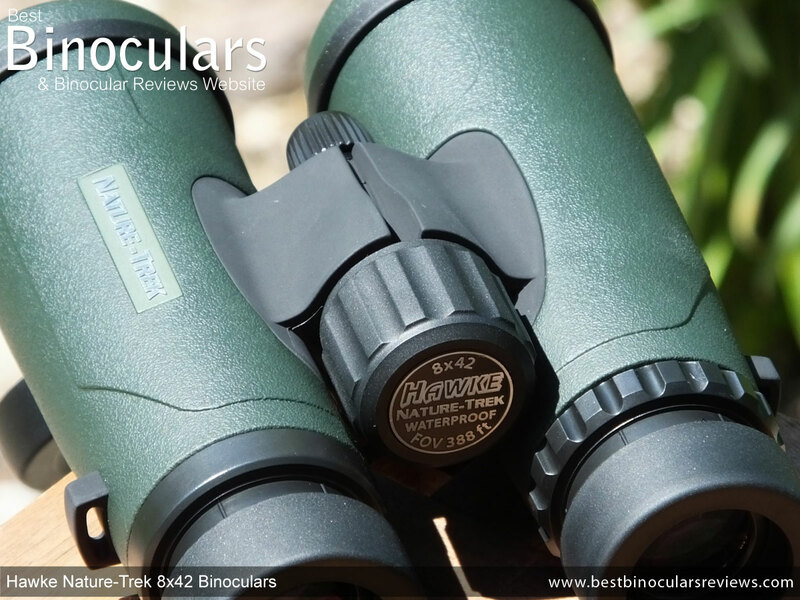 This review was written after I had thoroughly researched, used and tested the Hawke Nature-Trek 8x42 binocular, unlike the many others that I see that are written without the reviewer haven ever even seen the product. I would also like to make it clear that all the opinions that I have expressed on this page are my own and I am in no way biased towards any product or manufacturer. I do sometimes make mistakes or am supplied with incorrect details, so if you spot any please contact me so that it can be corrected.